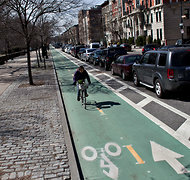 Two groups sought removal of the bike lane that was installed in 2010 along Prospect Park West in Brooklyn. The judge, Bert A. Bunyan of State Supreme Court in Brooklyn, found that the residents' lawsuit was filed after the statute of limitations had expired for a legal challenge to the lane, a mile-long, two-way path installed last summer along one of Brooklyn's wealthiest boulevards. The plaintiffs, a pair of well-connected civic groups in Brooklyn with ties to Iris Weinshall, a former city transportation commissioner, had accused the city's Transportation Department of cherry-picking statistics to create a favorable portrait of the lane and misleading residents about its benefits. The judge's decision did not address those claims or the merits of the lane itself. A lawyer for the plaintiffs, Jim Walden of the Manhattan firm Gibson Dunn, said in a statement on Tuesday that he disagreed with the court's decision and that the plaintiffs would review it "before deciding on our options." Mr. Walden, who argued the case pro bono, did not rule out an appeal. The suit, filed in March, had come to encapsulate a moment of unusual civic strife over one of City Hall's most notable policies. The city and its supporters say bicycle lanes are progressive, healthy additions to streets that reduce traffic accidents and promote more environmentally friendly modes of transport. Opponents have accused the city of neglecting the needs of car drivers and say the lanes can create dangers for pedestrians. "This decision results in a hands-down victory for communities across the city," Ms. Sadik-Khan said in a statement on Tuesday that described the plaintiffs as "dead wrong" in their arguments. "Merely not liking a change is no basis for a frivolous lawsuit to reverse it," she added. The judge's decision ultimately turned on a dispute over whether the lane had been installed on a trial basis, similar to the so-called "pilot" approach taken by Ms. Sadik-Khan on other high-profile projects, like the pedestrian plazas in Times and Herald Squares. The opponents argued that the city decided to make the lane permanent only after those statistics were released, thus putting their suit within the statute of limitations. But the city argued that the lane had been intended as permanent all along, and the judge found that the opponents "presented no evidence that D.O.T. viewed the bikeway as a pilot or temporary project." Mr. Walden, the plaintiffs' lawyer, said in his statement that "the judge had a very different and very independent view of the facts," and noted that the judge had dismissed some claims "without prejudice," meaning that another filing on the topic is still possible. The opponents did score one legal victory, however, as the judge found that the Transportation Department had not adequately complied with a Freedom of Information request for internal statistics and documents related to the bicycle lane. In one instance, the judge said the agency's denial of a particular request made "no sense." A version of this article appeared in print on August 17, 2011, on page A17 of the New York edition with the headline: Judge Rejects Groups' Effort To Remove Bike Lane.